The rapid growth of megacities like Lagos brings with it multiple health challenges. The world is today more fractured than at any time since the Cold War, with a new fortress narrative now emerging. But is it really possible for countries to reap the benefits of globalization and shun the responsibilities that come with a globalized economy, while avoiding the consequences of doing so? Globalism may have fallen out of favour with some, but the forces driving it are not likely to be so easily swayed. Formidable trends will continue to drive both globalization and globalism, and in doing so will bring new challenges that will threaten us all by, among other things, making it harder to prevent the spread of deadly infectious disease. So, in the face of such growing threats to global health security, it should become increasingly clear that putting national interests first doesn’t always mean focusing all your attention at home. The fact is that the same aspects of the modern world that have helped to make global trade and economic growth possible have also helped promote some of the biggest challenges we are likely to face in the 21st century. Climate change, population growth, human migration and urbanization are just some examples. All have an impact on global health security. Just as it is possible to have dinner in Nairobi, breakfast in London and lunch in New York, you can now also order goods from halfway around the world and receive them within a timeframe shorter than the incubation period of many infectious diseases. With more than a billion people travelling outside their country or region every year, it has never been easier for viruses to move around the world. We saw this recently, first with the Ebola epidemic in West Africa, which spread to 10 countries infecting nearly 29,000 people globally, killing 11,000 of them; and then with Zika, which affected more than 80 countries and territories, resulting in more than 220,000 confirmed cases. If we want to keep the bugs at bay, border security and immigration control will only get us so far. Instead we need to look at how we can prevent outbreaks in the first place. That means embracing globalism by investing in global health to help to strengthen national health systems, disease surveillance and routine immunization in poor countries. By recognizing that infectious disease is not some far away exotic issue, but a global problem, and by sharing the responsibility for its prevention, diagnosis and control, the whole world will be a lot safer. The problem is, thanks to the combined effects of population growth, climate change, migration and conflict, global health security is likely to become more challenging in the years to come. Land degradation, rising sea levels, famine and conflict will continue to drive people from their homes and towards cities, with megacities like Mexico City and Lagos becoming increasingly common in some of the poorest parts of the world. 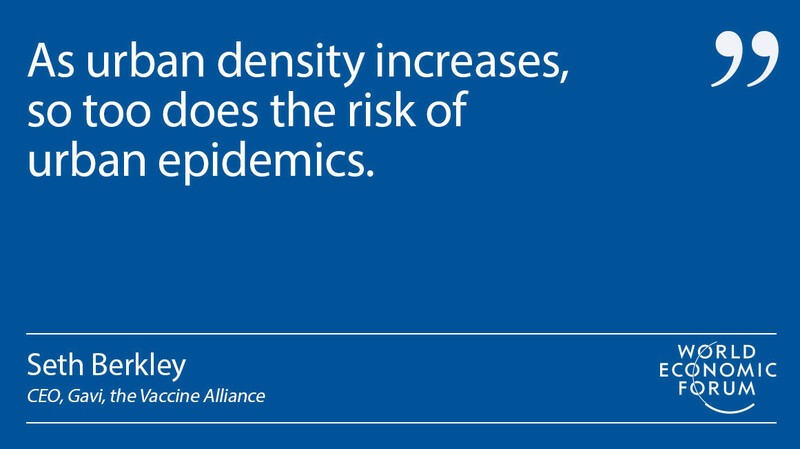 Without action, the effects of this on global health security could be profound, because as urban density increases, so too can the risk of urban epidemics. More people living in less space can put greater strain on already limited sanitation resources, and this can create a fertile breeding ground for waterborne infectious disease and the insects spreading them. At the same time, the sheer scale of cities, and the number of vulnerable people living in them, has the potential to overstretch vaccine and antimicrobial supplies, limiting our ability to prevent or respond to outbreaks. This is not just a hypothetical scenario. In 2016, we saw precisely this play out with the world’s largest yellow fever outbreak in three decades in Angola’s capital Luanda, which spread across Angola and to two other African countries, including threatening Kinshasa in the Democratic Republic of the Congo (DRC). During this outbreak, vaccine shortages made the situation so desperate that the World Health Organization and UNICEF had to resort to recommending fractional dosing in Kinshasa as part of its response, administering one-fifth of a normal dose to people. We got lucky, and not just in averting major urban epidemics in two overcrowded capital cities, but also in preventing the spread of yellow fever to Asia. No one really knows why yellow fever has never taken hold in Asia, but with 1.8 billion unvaccinated people living in a region where the mosquito responsible for transmitting the disease – Aedes aegypti – is endemic, and with no cure for the disease, the potential of it doing so is a huge concern (particularly, when two other Aedes transmitted infections – dengue and chikungunya – are causing major epidemics). With a large Chinese workforce in Angola, 11 yellow fever cases did manage to reach China, but were thankfully contained and the virus spread no further. And despite facing further vaccine shortages when another large outbreak occurred just a few months later in Brazil, the global health community rallied and was able to prevent this too from turning into an urban epidemic. But these were close calls. As the global population continues to grow and become ever more urban, it is important that we are prepared for what it will bring. While it will almost certainly help boost globalization by opening up new markets, without a continued global effort to prevent outbreaks wherever they occur, through routine immunization and strengthened health systems, then such close calls could become full blown pandemics threatening us all with catastrophic human and economic consequences.